I knew exactly what to name this buck the first time I unloaded him and got dragged all the way down the corral. He was like a Bulldog in his determination to get me to let him loose. I couldn't find the Swahili word for Bulldog, so I combined the Swahili words for "bull" and "dog" to come up with Mbwa Fahali. 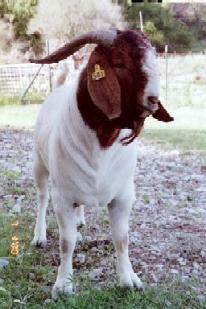 Like our other sires, he was selected because of his fast growth and excellent conformation. 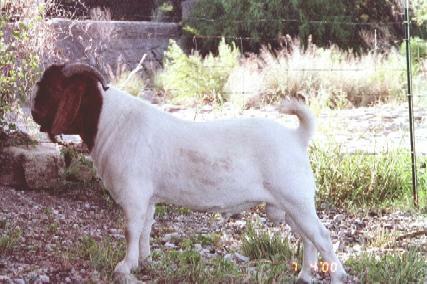 This buck ranked in the top 5% (#7 out of 142 bucks) in growth rate at the 1999 ASU Performance Test. He stands square on his front and rear legs, is long, and has a perfect bite. The underside of his tail is jet black, and his horns are set wide apart. At 1 year old he was as large as my 2 year old sires. Mbwa Fahali has an impressive pedigree that includes Natural Bridge Boer Goats' Tsjaka and J20, as well as, Downen Livestock's Ubora. His genetics are 100% South African. Annual Boer Goat Production Sale. At that point he was 6 months old and weighed over 145 lbs. After dragging me down the corral, he was let loose on a select group of our fullblood does, and must have gotten right to work that evening because 150 days later sets of triplets and quadruplets started hitting the ground left and right. The overall quality of his kids is impressive. The kids produced by mating Mbwa Fahali to Hakuna Matata's daughters are unbelievable. We sent 4 of his fullblood sons to the 2000 ASU Performance Test, and they gained on average .712 lbs/day making Mbwa Fahali one of the top sires that year. Over the years we tested 19 of his sons, and they gained .633 lbs/day, which is 12.8% more than average. We continued using Mbwa Fahali through the 2002 breeding season. Shortly after breeding season ended he developed a case of pinkeye. Although it was a fairly mild case, it was bad enough to impair his vision. On November 2, 2002 Mbwa Fahali wandered into the hot wire, and his horn got wrapped around it. He couldn't get free, and died.